Aw, men with ginger beards. They’ll never find love. 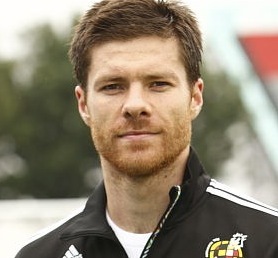 Except… Xabi seems to be one of the most fancied men in football. Ask the Kickette girls – they’ll tell you. Ginger cats, though – people love ginger cats. My family had a ginger cat one. We called him “Ginge” but his full name, improbably, was “Gingerlaijee Beaucoup”. Anyway, I digress. Thanks to Hootie (minus the Blowfish) for the spot. Like it a lot. But then I like both Alonso and Bateman a lot. Double win. Got a lookalike for Pies? Email ollie@anorak.co.uk with your suggestions. I have to say, when I saw “Up in the Air,” during every scene featuring Jason Bateman, I was completely distracted by his resemblance to Xabi Alonso. Xabi’s wife Nagore looks like Courtney Cox from Friends. And yes, men with ginger beards (at least Basque men named Xabi who have ginger beards) are very attractive. There’s also a heave dose of Mark Wahlberg going on there, methinks. I always thought Xabi looked alot like Ewan McGregor. And actually, when I saw Jason Bateman in the above picture I thought it was Ewan.